Ministry of Agriculture's initiative towards the credit requirements of agriculture sector. Kisan Credit Card Scheme aims at providing need based and timely credit support to the farmers for their cultivation needs as well as non-farm activities in a cost effective manner. 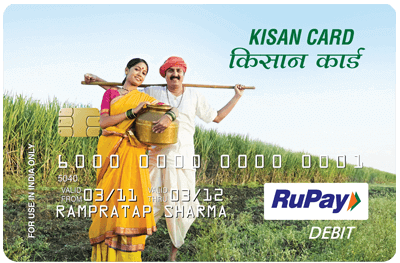 Farmers under this scheme are issued a RuPay Kisan Card on their account. The cards can currently be used at both ATMs and POS machines.